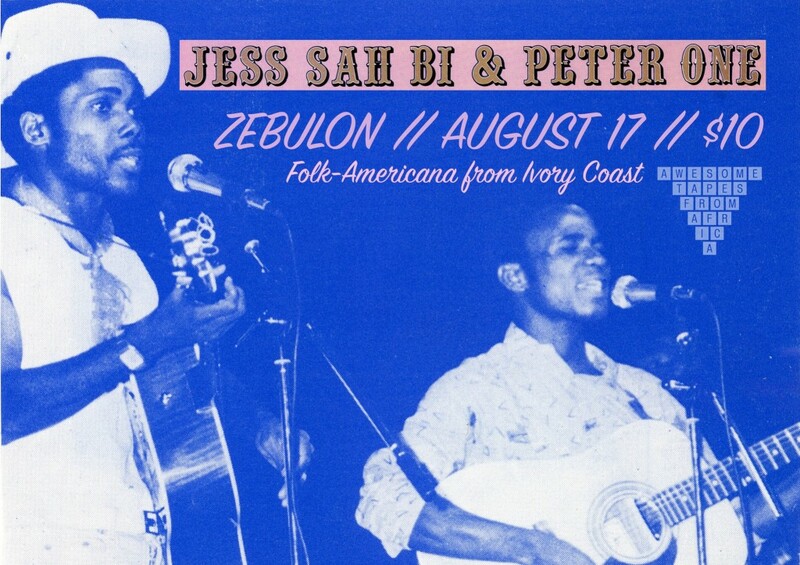 In the 1980s, Abidjan’s Jess Sah Bi & Peter One became one of the most popular musical acts in not just the Ivory Coast (Côte d’Ivoire), but broader West Africa, eventually performing with a full band to stadium-sized audiences at home and throughout Benin, Burkina Faso and Togo. Although they’d been popular radio and television performers for several years prior, the catalyst for Jess and Peter achieving this new level of stardom was their debut album, Our Garden Needs Its Flowers, recorded and released in 1985. In contrast with the heaving funk, disco and reggae sounds of the day, Our Garden Needs Its Flowers was a lush fusion of traditional Ivorian village songs and American and English country and folk-rock music. Jess and Peter sang in French, English and Gouro, delivering beautifully harmonized meditations on social injustice and inequality, calls for unity across the African continent, an end to apartheid in South Africa and the odd song for the ladies, all set against lush guitar riffs, rustic harmonica and rollicking feel-good rhythms. Surprisingly, it’s the first time the album has been re-released in a high-fidelity, legally-licensed form. Jess and Peter had shared experiences of loving and drawing inspiration from the traditional and ceremonial songs they remembered their mothers singing in their respective hometowns of Barata and Ono. In addition, hearing imported country and folk-rock music over the radio in the early ‘70s was a lightbulb moment for both of them. Jess recalls DJs playing Kenny Rogers, Don Williams and Dolly Parton on the radio in the morning, while Peter notes the significant presence Simon & Garfunkel, Cat Stevens, Crosby, Stills & Nash and Creedence Clearwater Revival had in his listening life. Country music and folk-rock weren’t very popular with the general public. But interest was bubbling up within the growing student population, who connected with the protest sentiments expressed by many English and American artists of the era and loved the sound as well. “It’s very nice music, with very nice harmonies, and it’s different from what you hear every day,” Peter says. “The language was a big barrier though. You had to learn English to understand the songs, and the students were the ones learning English.” Having access to education along with their awareness of growing social and political inequality and injustice made students the perfect audience for folk music in Ivory Coast. Now, in celebration of the re-release of their monumental debut by Awesome Tapes From Africa, Jess Sah Bi and Peter One reunite for a series of shows across the U.S., beginning in Los Angeles at Zebulon on August 17. Te’Amir Sweeney is an acclaimed Los Angeles-based drummer and producer who tours and records with soul singer, Aloe Blacc. He has played with many of the musicians who have crafted LA’s unique brand of hip-hop, beatmaking, jazz, and soul including: Sa-Ra Creative Partners, Kamasi Washington, Mark de Clive-Lowe, Miguel Atwood-Ferguson, Wondem, Kadhja Bonet, and Ethio-Cali.